Tough, Strong, Turned Billet Rear adjustable ride height and spring perch for your BMW. 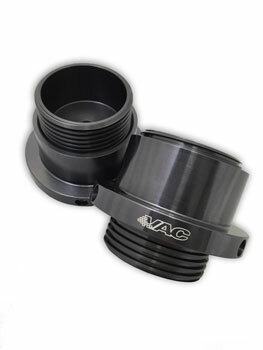 VAC Motorsports solution for the rear ride height adjusters are high quality products in made Philadelphia, USA. They feature easy height adjustments and no need for a locking set-screw, they can adjusted while still installed on the vehicle (assuming you have the car on jacks or equivalent). We have designed these to go in place of the OEM "beehive" style rear spring on several different chassis, including E39, E36 and E46 where the stock spring ID is 2.5".